We are back with Day 8 of our 12 Days of Christmas series. 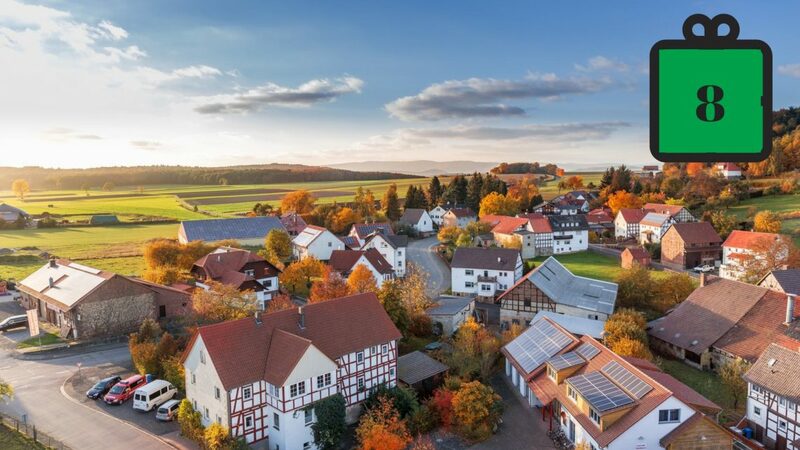 SmartVillages, also referred to as, ‘Villages of the Future,’ are community led initiatives that empower rural towns and villages to overcome the digital divide between urban and rural areas through improved connectivity. Today, we will be sharing our top 8 Reasons Why We Love SmartVillages. The life and soul of the city is generally what attracts young professionals to the likes of London or Dublin. Late night bars, extended public transport, an abundance of choice and above all else the, ‘cocktail bars’, that serve candy floss and popcorn accompaniments. By regenerating local towns and increasing local populations, it will be possible to create a buzz in your town. Whether it be Midleton, Abbeyleix, Dunhill or Roscarberry, the life and soul of the town will incentivise people to return. There is a saying which refers to the, ‘little happy dance’, that a local craftsman or designer does when you place an order. This order is fueling ambition, supporting the local economy and fulfilling one’s dreams. In a recent initiative rolled out by Retail Excellence Ireland, it was revealed that for every 1 Euro you spent on local produce, 4 Euro goes back into the local economy. SmartVillages promotes local brands and crafts. By growing and sustaining business, SmartVillages give local trades the opportunity to go further a field and perhaps make connections with customers and clientele further afield. As they say, it’s very much about who you know by nurturing local areas, we are highlighting their potential to potential investors further afield. Companies are drawn to cities because it is almost a given that these areas will encompass staff, infrastructure and skills. SmartVillages have these too. For companies looking to set up in Ireland, fixed costs such as rent are cheaper outside larger cities and they also have access to a broad range of talent pools in different pockets around the country. Many young professionals leave home to seek better opportunities elsewhere. During the recession, an abundance of construction workers and healthcare professionals moved overseas to seek employment. Could we incentivise them to return home? With SmartVillages, we can. If expats can see the improvements in local areas in terms of technology, infrastructure and job opportunities, they will be far more likely to return home as they will be closer to family, friends and the odd pack of Tayto! It is what it says on the tin, strength is better in numbers. When locals pool together to promote their SmartVillage, anything can happen! By drawing professionals out from big cities, we are inadvertently reducing the number of cars travelling to and from the larger cities, thus reducing traffic levels. The concept of rural regeneration is progressive and an initiative that the government very much wants to support. Under the Rural Regeneration and Development fund and Project Ireland 2040, the Government will provide an additional €1 billion for a new Rural Regeneration and Development Fund over the period 2019 to 2027. The Fund will provide investment to support rural renewal for suitable projects in towns and villages with a population of less than 10,000. We hope that with strong support from the government, we can continue to grow our base of SmartVillages!